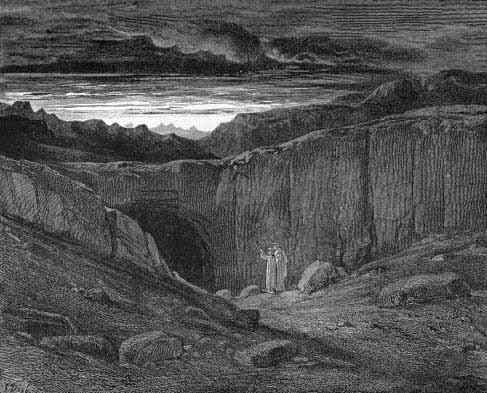 guiding Dante into the Inferno at Lake Averno. Naples is the entrance to Hell (at Lake Averno, if you're interested); it's where you descend to question the spirits of your ancestors about lucky lottery numbers, and it's the abode of mythical subterranean dwellers, the Cimmerians. In other words, if you look at the stars and feel blissful and transcendent, you've come to the wrong place. And think of the river people of the Sundarbans delta in the Bay of Bengal, the so-called "Forest of Tides." Every Bagladeshi schoolchild knows from memory a sonnet that has the lines: "Always, O river, you enter my mind. / In my loneliness I think of you. /My ears soothe at the murmur / of your waters. / Many a river I have seen on earth, / But none quench thirst as do you, / as flows milk from my homeland's breast. Are there then Desert peoples? Certainly. People of the Mountains? No doubt. And so on and so forth. They have all been shaped by the worlds they were born into. The Greeks built their cities, Parthenope and then Neapolis, here precisely because it was so easy to get underground. There was an ample supply of rock, yellow volcanic tuff, to build with, much of it easily accessible right at the surface or just below. They quarried the rock for dwellings and city walls. The empty spaces where the rock had been, however, did not go to waste. 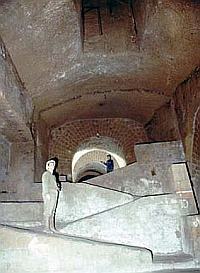 They became tombs and, importantly, cisterns to hold water brought from the slopes of Vesuvius by means of the aqueduct. Then along came the master aqueduct builders, the Romans, and expanded it all, especially the aqueduct. They integrated the Greek aqueduct with their own and brought water to Naples from the Serino river near Avellino. That aqueduct outlasted the Western Roman empire by a thousand years and met the needs of the population until the early 1600s, when the capital city of the now Spanish vice-realm of Naples —the largest and best-defended city in the first empire on which the sun never set— needed more water. The Spanish finished the Carmignano aqueduct in 1636, tapping waters of the Faenza (today called the Isclero) river in Benevento. It was the final stage of the new system of water supply that integrated all preexisting aqueducts to form a tight network of tunnels and cisterns beneath every building in the city. A bit later, the Bourbons built the Carolino Aqueduct, one of the great engineering feats of the 1700s in Europe. It had taken two-thousands years, but it was the finishing touch to what has been called a “subsoil negative” —a reverse image of the city, itself, millions of cubic meters of empty space, all of which could be traversed. It was marvelous engineering and lasted until 1885. Then, a strange thing happened. These same Neapolitans, with their intimate obsession with caves, quarries and myths of darkness,suddenly disowned it all. There are a few “culprits” here, although maybe that's not the right word. After all, a new and modern high-pressure aqueduct wasn't such a bad idea in a city that had just suffered through a series of typhus epidemics. Increase the water supply, improve hygiene, etc. etc. That's the ticket! With new pipes we can forget about all those ancient cisterns, quarries and holes in the ground. And that is what happened. Neapolitans lost interest in the subsoil that had given birth to the city and grown with her. The old quarries just lay there untended until a real culprit came along —World War Two. Naples was subject to heavy bombing during the war (that story is here), as a result of which the people took a renewed interest in their old friends, outfitting them as public air-raid shelters. By war's end (Sept.1943 in southern Italy) 210 such shelters had been built, with a combined capacity of 219,000 persons. Once again the spaces served the populace well, and once again they were forgotten. No, worse, they were abused horribly. 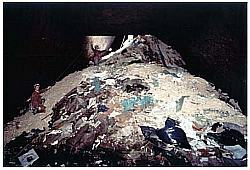 First, they were used as dumps for the considerable amount of rubble generated from wartime bombings. There are displays today in a few of the larger shelters that show you some of the stuff people unloaded into quarries besides shattered pieces of lumber, masonry and cement: old cars, random personal effects tossed away because the owners were gone, half-intact hulking marble statues of former Fascist heroes, and so forth. Unfortunately, that habit has continued, though no one will own up to using a nearby abandoned well or cistern as an illegal rubbish dump. The post-war binge of overbuilding, especially in the 1950s and 60s, for all the sense of prosperity it generated, aggravated the situation by building on land that is honeycombed with empty spaces. Those old quarries still hold water—rain run-off—but they just sit there with heavy new apartment complexes or streets on top of them and slowly leak water into the subsoil. The leaks get bigger and start to siphon away the foundations of surface structures. 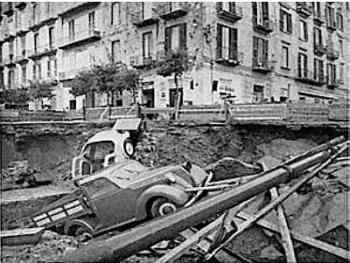 Over the last few decades, there have been numerous cave-in, earth-slides, and sink-holes in the city, causing enormous damage and even loss of human life. Commissions to study these dangers have been around since the 1960s, but I'm not aware that anyone took them seriously (the commissions or the dangers) until the 1990s. It's not an easy problem since you cannot un-build what has already been built. I suppose you just get better at patching and repairing the damage. Perhaps there is a Chernobyl-type solution—fill every old quarry and cistern with concrete. There are, however, 700 of them down there. I have based much of this on Structural Problems of the Neapolitan Subsoil by Clemente Esposito. That report is available as a .pdf download on the website of Napoli Underground, here. photo credits: the bottom three photos are courtesy of Napoli Underground (Nug). Also, my own Underground portal (link below) has other relevant entries besides those linked directly in the text.